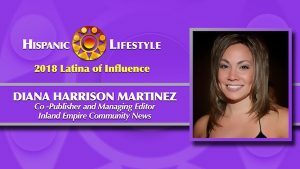 On this the last day of Women’s history month 2018, Hispanic Lifestyle remembers our friend and colleague who passed away almost a year ago Diana Harrison Martinez as a 2018 Latina of Influence. She spent her professional career assisting parents Gloria Macias-Harrison a Latina of Influence and father Bill operate the family owned media company the Inland Empire Community News Group. Diana was the Co -Publisher and Managing Editor The Inland Empire Community Newspapers which covers the cities of Colton, Grand Terrace, Highland, Loma Linda, Redlands, Rialto and San Bernardino, California. From our friends at IECN . . .